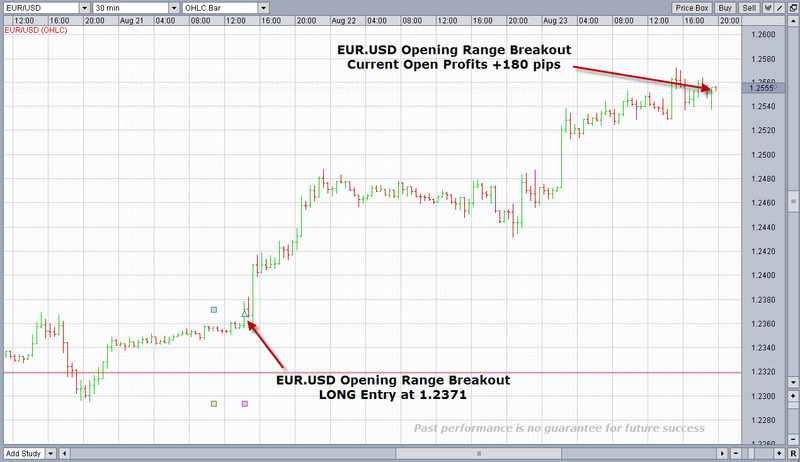 It has been an incredible week of profits so far for Volatility Breakout traders in the Forex Markets (see euro chart above). On Monday we pointed out in our live update that euro and Swiss franc had formed weekly inside bars and that a big range breakout move was likely to follow. Weekly Volatility breakouts work on the premise that when there is a ‘big range weekly bar’, defined as a bar whose range is two times greater than the 70 bar average range, prices will often open and close at opposite extremes. The bigger the range, the more extreme the close. Typically a big range bar will close within the upper 10-20% of the bar on up moves and lower 10-20% of the bar on down moves. So when you expect a big range bar, as we did this week following last weeks inside bar, what we want to do is enter as soon as possible in the direction of the initial move with the expectation that this move will continue through the week and close somewhere in the extreme 10-20% of the weeks range on Friday close. Inside bars reflect indecision and lack of commitment amongst traders, and whilst this indecision persists disciplined traders are inclined to stand down from the markets. As soon as price starts to move away from the congestion zone, smart money rapidly enters back into the market for early entry into the next move. As the move gathers pace other traders notice the shift in momentum and jump on board too. Traders who are wrongly positioned start to feel some pain and are forced to liquidate their positions which adds further fuel to the move.